So to begin…what is yoga? More than just postures, yoga originated in India as an ancient science to enhance the well-being of the body, mind, and soul. It is about providing holistic health through physical exercise, breathing, relaxation, diet, and philosophical practices. The wonderful thing about yoga is that it is accessible and beneficial to every person—old and young, female and male, religious and secular—through disability, illness, and good health. True yoga is completely non-competitive and non-goal-driven and this is what sets it apart from other forms of activities or therapies for children and adults with special needs. It also does not put a strain on the heart, joints, and working systems of the body. Instead, the yoga postures (called asanas) are designed to stimulate and support the internal organs and processes, to promote a long and healthy life. Regular practice provides countless health benefits and, in addition, is about bringing awareness to our mental and emotional health. There are many different forms of yoga—Hatha, Vinyasa and Iyengar to name a few—and similarly, a number of methods have been developed to specifically help children with special educational needs (SEN). The method referred to in this article is called Yoga for the Special Child: The Sonia Sumar Method. It was created by yoga teacher Sonia Sumar more than 45 years ago, following the birth of her second daughter. Roberta was diagnosed with Down syndrome, and Sonia was told she would have a life of limitations. However, Sonia began doing yoga with Roberta from infancy, with results that astonished her doctors. This led to Sonia working with other children with special needs and developing a recognized method which became known as Yoga for the Special Child and now has worldwide recognition as the pioneering practice for special needs. Sumar Method has helped children across the globe with a variety of conditions from autism and attention deficit disorder (ADD)/attention deficit hyperactivity disorder (ADHD) to cerebral palsy, Down syndrome, epilepsy, and so on. The key characteristic for children diagnosed with cerebral palsy is that they often have both high and low muscle tone which affects their movement. Learning a sequence of asanas builds greater strength, flexibility, and coordination in the limbs and body. Incorporating forward bends, backward bends, lateral bends, and twists the body moves in every direction working the bones, muscles, cartilage, and nerves within. Of particular note is that yoga poses stretch and realign the spine, the telegraph pole of the body. The Spinal Twist pose for example, will create space between the vertebrae, reduce pressure on the discs of cartilage, and relax the nerves that radiate out of the spine. This, in turn, releases muscular tension throughout the body and enhances overall nerve function. Over time, a child is able to develop an increased range of movement and coordination, meaning increased independence. As yoga works holistically, the practice can improve strength, coordination, balance, respiration, eyesight, and many other key areas for children with Down syndrome. The genetic condition categorizes with weak muscle tone, and since all the internal organs are themselves muscles, there is a tendency for children with Down syndrome to have weaker internal systems. Through regular practice of yoga this can be addressed and improved. This is one reason why yogic breathing exercises are so beneficial, as they not only improve the respiratory system but also strengthen the internal organs, improving general health and development. Over time, these exercises will improve the central nervous system’s functioning and impact motor and cognitive development—boosting body awareness, concentration, and memory to have a positive effect on the child’s everyday life and learning abilities. Joint dislocation is also quite commonly suffered by children with Down syndrome, so working on body strength and core strength is fundamental. Therefore, asanas such as plank pose are of great benefit in terms of strengthening the whole body. 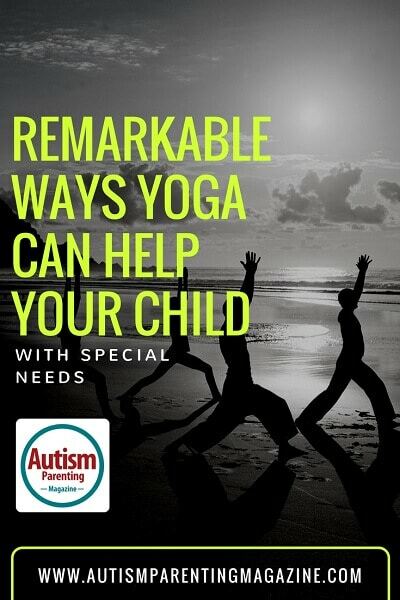 First and foremost with autism, yoga neutralizes and calms the sympathetic nervous system, bringing inner peacefulness. For the child, this means better sleep, better concentration, and better ability to self-regulate. Soft chanting and sitting postures at the beginning of class are important for children with autism; it supports their sensitivities to the external world by bringing inner balance so they can make the transition to do yoga, as well as other activities. A key breathing technique for children with autism is deep belly breath. It is very beneficial as their natural breathing is often shallow and fast, and they are often mouth breathers. This means the quality of air is not the same as a child who breathes through the nose, which is designed to filter the air before it enters the lungs. Building mutual trust and friendship with their yoga teachers is also a fantastic benefit for children with autism. A bond can be developed naturally in a yoga session precisely because the practice is free-flowing and flexible, rather than focused on achieving set positions or outcomes. The teacher patiently enters the world of the children, meeting them on their own level rather than telling them their world is the wrong one. For children diagnosed with attention deficit disorder (ADD) or attention deficit hyperactivity disorder (ADHD), the most valuable benefit of yoga is calming them down and improving their concentration and focus. Again, yogic breathing exercises are highly important to this process. There is a fundamental link between the breath, the mind, and the emotions. All are intimately connected, so by bringing awareness to the breath and fostering calm, controlled breathing patterns, we automatically see a more peaceful and relaxed child. Physically, yogic breathwork (pranayama) stimulates vital areas of the brain and central nervous system. Regular practice helps the child to relax and focus more and more, enabling the teacher to also bring in practice of deep relaxation, enhancing all the benefits of calmness, awareness, and concentration. Deep relaxation is an essential part of yoga. In our modern lives of ongoing choice, stimulation, and distraction, real relaxation is often overlooked. This is where the spiritual element of yoga will first appear, as children are given an opportunity to be with their own silences and internal awareness. For a child with ADD or ADHD, yoga practice can have significant results, increasing capacity for schoolwork and peaceful social interaction. It cannot be emphasized enough that a core aim of Sonia Sumar Method yoga practice is to promote a happy child. It is completely individually focused, and not condition focused. Often, as a child with special needs, physical needs are the primary focus and physical milestones become the measure of his/her health and identity—while essential tools for a happy life like self-esteem and self-acceptance are not considered. With yoga, the emotional, mental, and spiritual well-being of the child is given as much importance as the physical. This is what makes yoga so unique and life-affirming for children with special needs. Denisa Nenova is the founder of MahaDevi Centre, the only yoga center in the UK that offers the pioneering yoga therapy Yoga for the Special Child: the Sonia Sumar Method for children and adults with special needs. The center is located in North London and is open seven days a week, currently offering one to one yoga therapy to more than 60 students weekly.